MANHATTAN — As winter's thaw starts to lift (hopefully), more sellers are planning to put their homes on the market, and buyers should brace for crowded open houses. In New York City's seasonal market, winter months tend to be the quietest, followed by a flurry of activity in the spring. Prices then trend upward through summer, according to an analysis of the past 5 years of listings for Manhattan, Brooklyn, Queens and The Bronx, StreetEasy compiled for DNAinfo. Homes linger longer in January and February, sitting on the market for an average of 107 and 100 days, respectively, StreetEasy found. They move fastest April and May, averaging 67 and 66 days respectively. Prices tend to be lowest in February — averaging $443,490 over 5 years across the boroughs excluding Staten Island — and creep up each month until hitting their peak in July, when the median prices averaged $513,071, StreetEasy found. "By all accounts, the New York City real estate market is running on all pistons in the spring," StreetEasy's Alan Lightfeldt said. Here's what house hunters can expect this spring season. 1. More listings will hit the market. Many sellers have been waiting to list their homes, believing they'll get more action at open houses in warmer weather and that their homes and neighborhood, overall, will seem brighter, brokers said. The "first impression" is the most important for an open house. So, if a blizzard hits during that initial showing, it slows down the momentum, and "you blow it," said Rebecca Brooksher, of Warburg Realty, whose Upper West Side office is getting ready to list four new apartments. "If you've been looking and you're frustrated, hang in there," Brooksher said. "Things are coming on the market." At least half a dozen sellers asked Doug Perlson, of RealDirect, to wait to list their units until "it's warmer and more hospitable" out. "Sellers don't want people trudging through their apartments with slush all over their feet," he said. Sellers also prefer waiting for warmer weather because it's easier for them to "schlep the kids out" and leave their homes during open houses, Deborah Rieders, of Corcoran, noted. 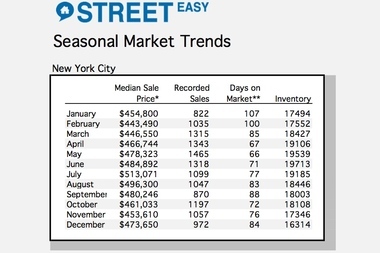 Inventory typically ramps up now and reaches its annual peak in June, according to StreetEasy data. 2. There will also be more competition. The spring season is always the busiest time of year, especially for families who want their kids to start new schools in September, brokers said. But be prepared for an even bigger surge. "Vanity" buyers — those who don't necessarily have to move but are looking for an upgrade, will come off the sidelines to join the "real" buyers who look regardless of the weather, Rieders said. 3. But it might not feel as frenzied as last year. Though bidding wars won't disappear, the tone seems to be changing, some said. *Average of monthly median sales price between 2010 and 2014. Recorded sales. ** Day on market is the number of days between original listing on StreetEasy and contract signing. ***Each metric is presented as average of monthly median sales. Last spring, house hunters worried about the imminent threat of rising interest rates, Brooksher said. This year, buyers are not as "panicked" by rates. "Things feel more relaxed," she said. "Where there used to be 10 offers, now there are five." 4. Expect higher prices than last year. Be prepared to pay more than what comps — or similar units — went for last year, Perlson said. "Buyers need to understand they will need to pay more than they would have last year," he said. "If you don't go in with that assumption or belief you're not going to play." 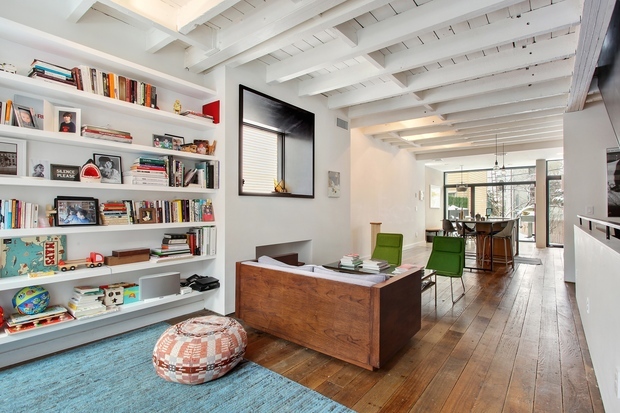 The best way to get a deal, he advised, is to find something unrenovated. Though average prices might not jump by 20 percent, as they did last year for Manhattan apartments, they might rise by 8 to 10 percent, projected Veronica Raehse, of BOND New York. "I had an appraiser say to me last year he was appraising for 1 percent appreciation per month for prices. I've been using that for middle market [priced homes] for time they go into contract, not time they close," she said, since it often takes a few months to close. 5. Brokers want you to bid up. Many brokers are pricing a little lower than what they think they can get right now, Brooksher said. They believe they can get more potential buyers into their open houses and that will spur a bidding war. "Then people end up bidding more then they would have," Brooksher noted. As neighborhoods like Crown Heights, Bed-Stuy, Bushwick and Ridgewood are already seeing an acceleration of gentrification, it's a bit tricker to find the good investment opportunities there, Perlson said. He's betting on Queens neighborhoods like Jackson Heights, Sunnyside and Forest Hills, that have relatively easy commutes to Manhattan, good schools and restaurants. "I think they are going to be on the upswing," he said. He also likes the "great housing stock" in Brooklyn neighborhoods that saw a big flight to suburbs in the Robert Moses era, like Victorian Flatbush, Prospect Park South and Ditmas Park. "These areas that really suffered when there was flight to the suburbs are benefitting now that people are returning to city living," he said, adding, "You're seeing it already like Crown Heights and Bed-Stuy." 7. Make sure you're ready to pounce. Because traffic at showings will be "through the roof," it's crucial for buyers to have their financial papers and team of mortgage brokers and lawyers ready to go, said David Gomez Pearlberg, of Town Residential. "They need to pull the trigger fast if they like a place," he said. "Otherwise someone else will,"
It helps to have a good broker who has good comps at his or her fingertips to guide you quickly, many agents advised. "I work with a lot of first time buyers who think they can just get a feel for the market," Brooksher said. "But then they find something they like, and it's going to 'best and final' tomorrow."